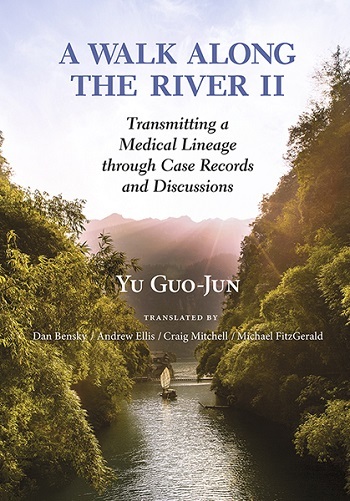 A Walk Along the River II picks up where the first volume left off, presenting the remaining chapters in the collection of case studies from the practice of Yu Guo-Jun and his teacher, Jiang Er-Xun, a modern-day master of classical formulas. Twenty-two additional case studies are presented including disorders of the qi, blood and body fluids; generalized disorders; gynecology and obstetrics; and pediatrics. There is also a personal essay by the author that traces his path in the study and practice of traditional Chinese medicine, and a bonus case study that explores time and space in Chinese medical therapeutics. Dr. Yu is a prominent physician-scholar of traditional Chinese medicine in the city of Leshan in Sichuan province. In cases ranging from coughs, palpitations, and dizziness to vomiting, depression, and skin issues, Dr. Yu provides incisive and practical advice on the process of diagnosis. He also shares his experience and that of his lineage of teachers on how to use the rich materia medica of Chinese medicine to achieve the best results. If you use Chinese herbs in decoction as a primary form of treatment, drop everything and run out to buy this book. WAIT! Better call ahead to make sure the bookshop still has a copy. I unhesitatingly recommend it as an addition to the library of any serious practitioner. For no matter how experienced or well-read you may be, I am certain this book will improve your skills and clinical outcomes. It most certainly has done so for me. Each time I pick up A Walk Along the River II and begin to read a case, I feel electrified. Dr. Yu’s openness about his process, his lively discussions with other doctors about cases and formulas, and his strategic and tactical assessment of the clinical encounter are astonishing. Each case and discussion is full of clinical gems that go far beyond the case itself, and deeply engage the reader with the foundational principles of Chinese medicine. Sprinkled throughout the book are fascinating tidbits relating to individual herbs and formulas. This is the medicine we all went to school to learn and Dr. Yu effortlessly puts it in our grasp. As I read A Walk Along the River, I felt as if I were sitting with Dr. Yu in his clinic. In a warm and personable style, he goes over each case in wonderful detail. The whole text is written in a conversational style with other physicians asking questions of Dr. Yu. Practitioners will want to read it cover to cover to integrate every jewel.